One of the Best Kept Secrets in the North! Remote, drive-in camp located in Northwest Ontario, Canada, Woman River Camp is off the beaten path, resulting in the best of both worlds; remote and easy to travel to. With 80% repeat guests, few others have the chance to enjoy one of the best kept secrets in the north! Our unique multi-species fishery offers outstanding fishing for Walleye, Northern Pike, Smallmouth Bass, Yellow Perch, and Lake Trout. Terrific numbers of eater fish and an excellent chance for that trophy of a lifetime! Pristine, wildlife, solitude, adventure and relaxing are just a few of the incredible attributes of Woman River Camp. Family owned and operated, we specialize in housekeeping and hospitality! Woman River Camp’s unique multi species fishery offers outstanding fishing for Walleye, Northern Pike, Smallmouth Bass, Yellow Perch, and Lake Trout! 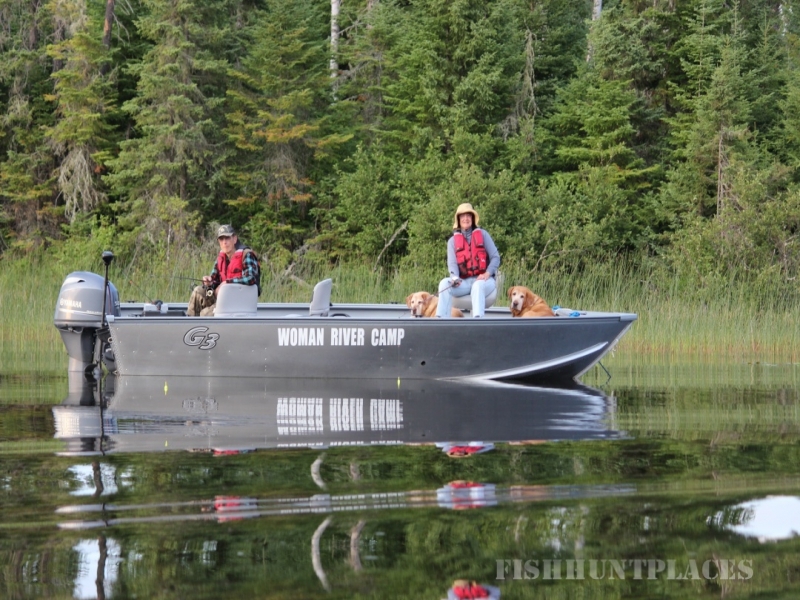 Come enjoy the pristine waters, variety and abundance of game fish in the Woman River chain of lakes! 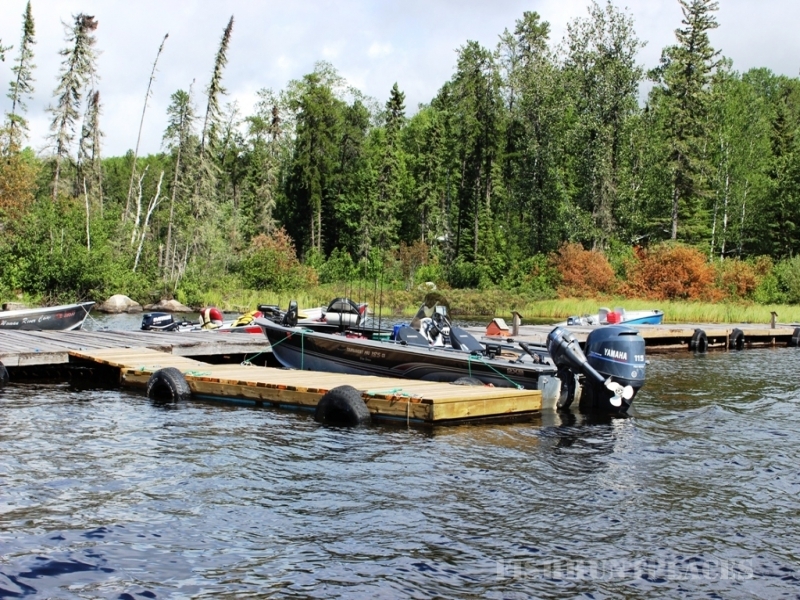 These quiet, remote, easy to navigate waters are an anglers paradise! countless bays, islands, and a seemingly endless shoreline provide remoteness and seclusion for all fishermen. Do you have a desire for even more adventure? 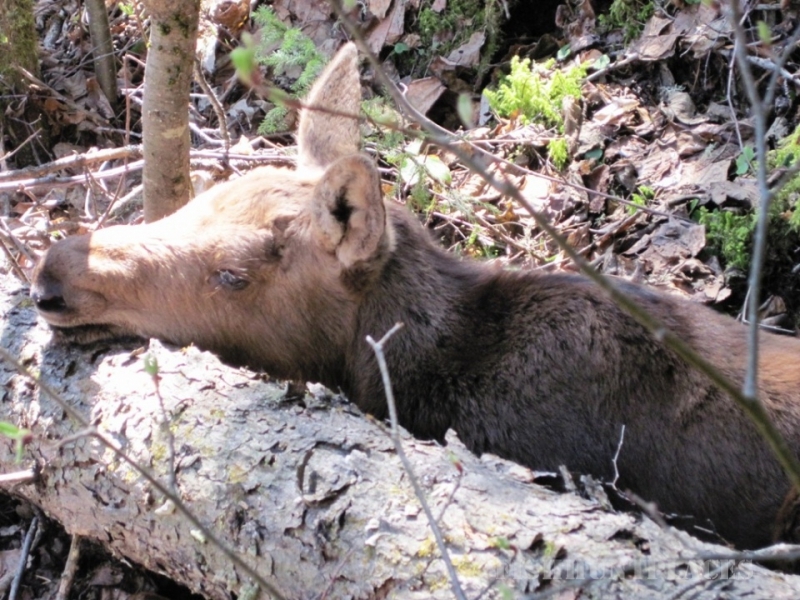 – Take a portage lake fishing trip or book aRemote Wilderness Adventure! Walleye is the number one sought after fish on the river system. Anglers enjoy catching Walleye with many different fishing techniques. The size of the fish varies from fishing hole to fishing hole. 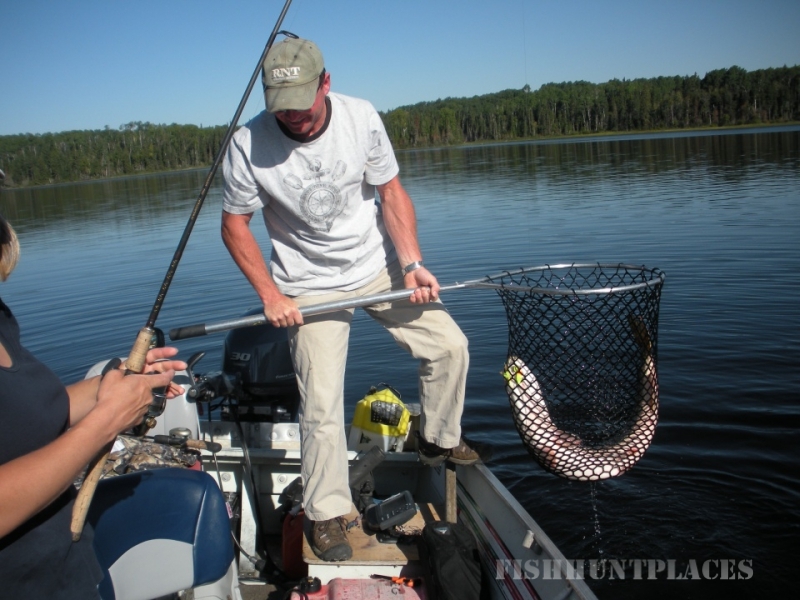 The largest trophy caught measured a whopping 34” long and was released to fight another day. The Woman River chain is not just about the trophies, these waters produce some of the tastiest fillets in Ontario’s Sunset Country! The average size Walleye is between 16-18” depending on the fishing hole. Our guests are required to practice catch and release on all Walleye over 18” to keep the larger breeders in the water. I don’t know if I feel bad or jealous when guests come back and tell me they couldn’t eat shorelunch because all the fish they were catching were too big for the dinner plate! Great Walleye fishing can be found in plenty of our portage lakes as well. Anglers come back to camp and describe the Northern Pike fishing with words like “explosive, ferocious, monsters”! Northern Pike are a lot like Black Bear, they have an endless appetite and are the most opportunistic fish in the lake! If it perks an interest with their fishy senses, they will try and eat it. Trophy Northern Pike on The Woman River grow to monstrous sizes with the biggest I ever witnessed measuring 52”! One of our guests has had two unbelievable days on two separate fishing trips to the lake, landing 6 and 7 Northern Pike all over 40”! 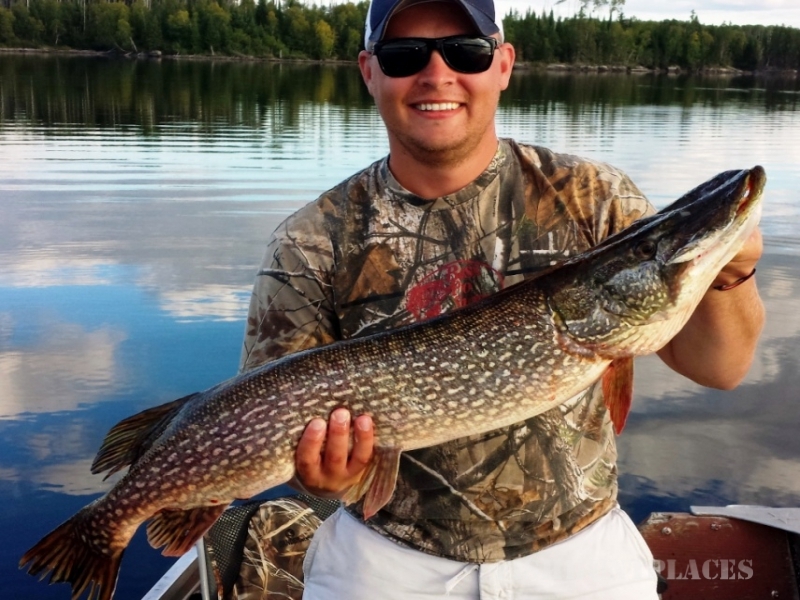 Our guests are required to release all Northern Pike over 27”. We have a no trophy take out policy leaving these amazing fish to fight another day! Most of our trophy Northern Pike are caught on the Woman River chain but monsters are also caught on most portage lakes. Lake Trout have a mystical quality that appeals to the most determined angler. Lake Trout are very strong swimmers. When they decide they want your lure, you can’t reel fast enough to keep it away. Lake Trout are considered one of the hardest battling freshwater fish. Cast or troll for Lake Trout in the spring as they enjoy roaming throughout the water column and again in the fall when the lake turns over. During the warm days of summer fish can be found 30ft and deeper. Try jigging, long lining or downrigging in the deep holes near Woman River Outpost or on Confederation Lake. The average length is right around our 25” catch and release size limit, with trophies measuring as long as 39”. These “tanks” will eat anything! Even other Lake Trout! Pound for pound, Smallmouth Bass are one of the fiercest fighters in the lake. Find a rock pile and there will most likely be a Bass there ready to ambush your lure. They love chomping down on crayfish and we love it when they fly out of the water at our topwater presentations! Their shaped just like a football, big and healthy. 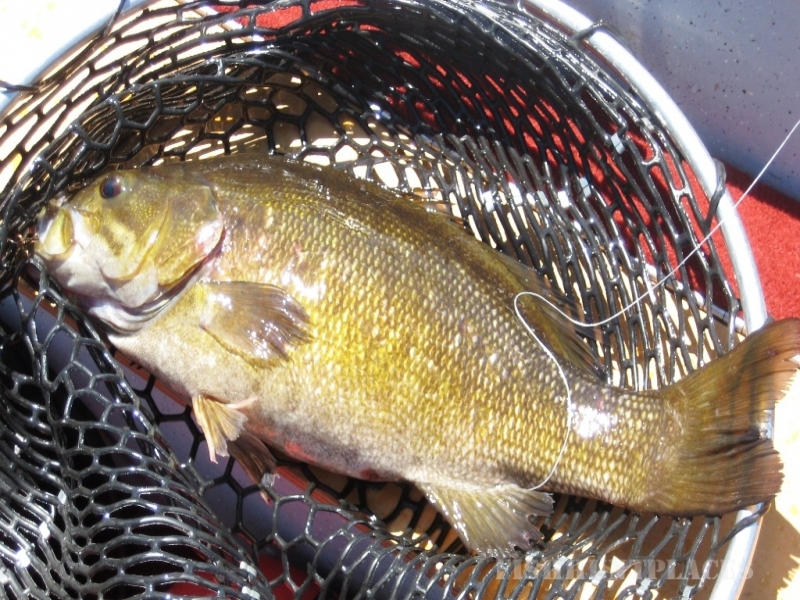 Bronzebacks roam throughout the Woman River and in Spot and Little Walleye portage lakes. The average size is 14-16” with plenty over 18” and the occasional 21-22” beast are caught. Catch them casting, jigging, drop shot rigging and fly fishing. Anglers drool over a cooler full of Perch. Nowadays with electric fillet knives, I don’t mind putting the effort into cleaning them. They love the weeds and a patient angler can do very well with our chunky Perch. Most use a piece of nightcrawler on a hook under a slip bobber. Large Perch aren’t afraid of attacking larger artificial baits. Guests ask if the Perch have yellow grubs? In general, there are very few fish with grubs. The deeper the water the less likely they will have grubs. You can also look at the tail and gills to see if the fish has an over abundance of grubs. When thoroughly cooked, the fish is safe to eat. Help prevent the infection of fish you release by either releasing the fish in the water or wetting your hands before touching the fish. This leaves their protective mucous coating on the fish which prevents infection. Wet hands are important when handling all types of fish. Perch don’t have long lives and top out at about 15” on the Woman River. Other great fishing opportunities include tasty Whitefish and Burbot (poor man’s lobster). Both of these fish swim in deep water. Formidable catches on light tackle! Hunting is a passion both Debbie and I have at Woman River Camp! 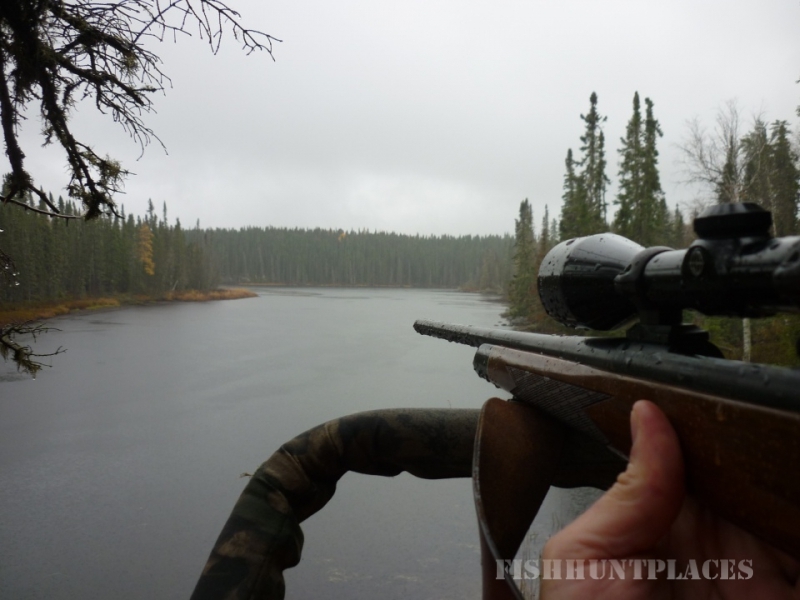 When fall comes around, it’s tough for us to pick up a fishing rod when there are so many great hunting opportunities in Northwestern Ontario. 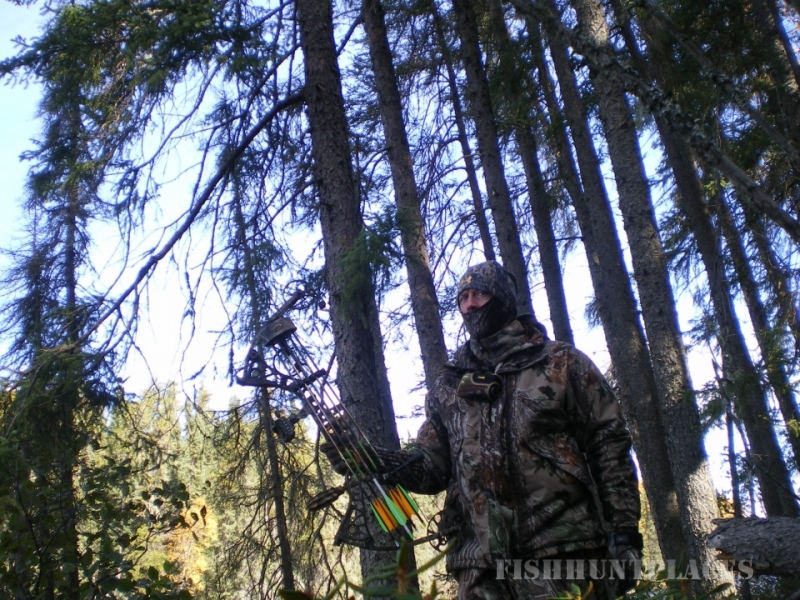 We are blessed with the abundant game roaming around in our neck of the woods. 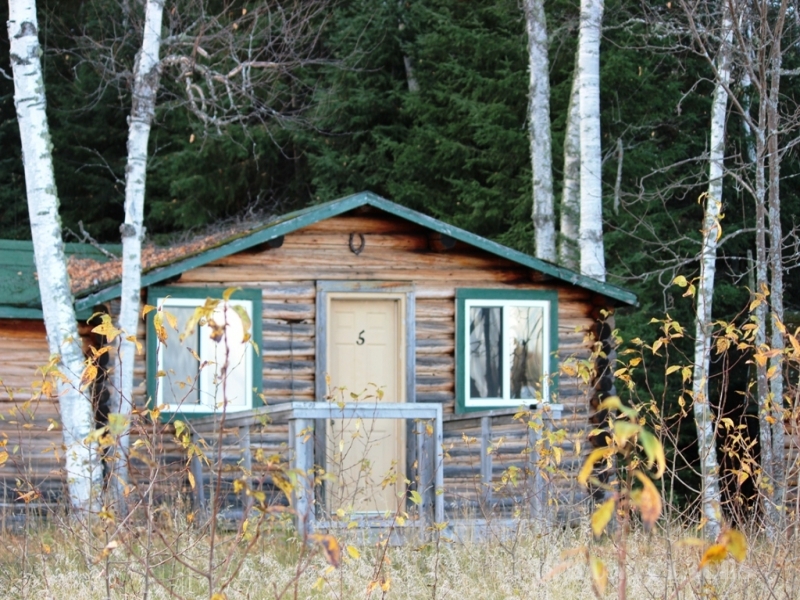 Woman River Camp has been hosting hunters for over 30 years. 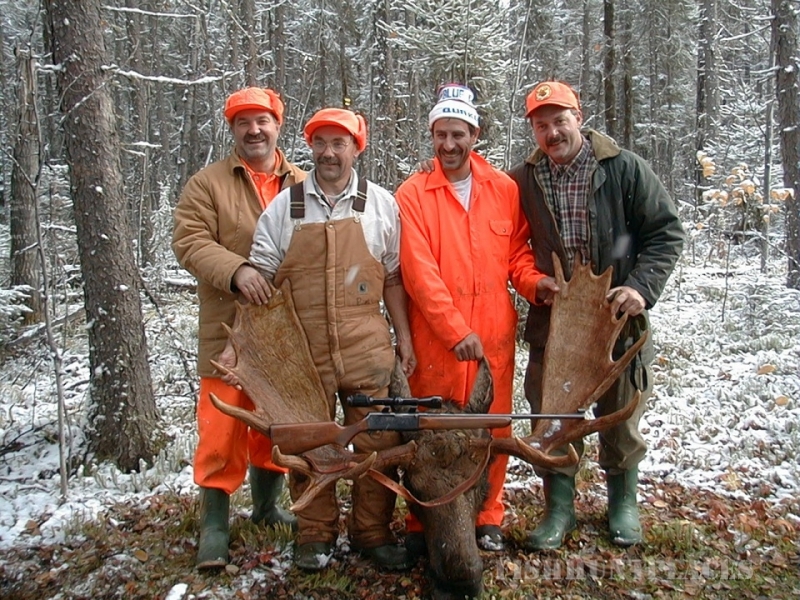 Our experience in the field helps us with our success rates and provides our hunters with an overall great experience in the Canadian woods. We treat all our natural resources with the utmost respect and request our guest to do the same. 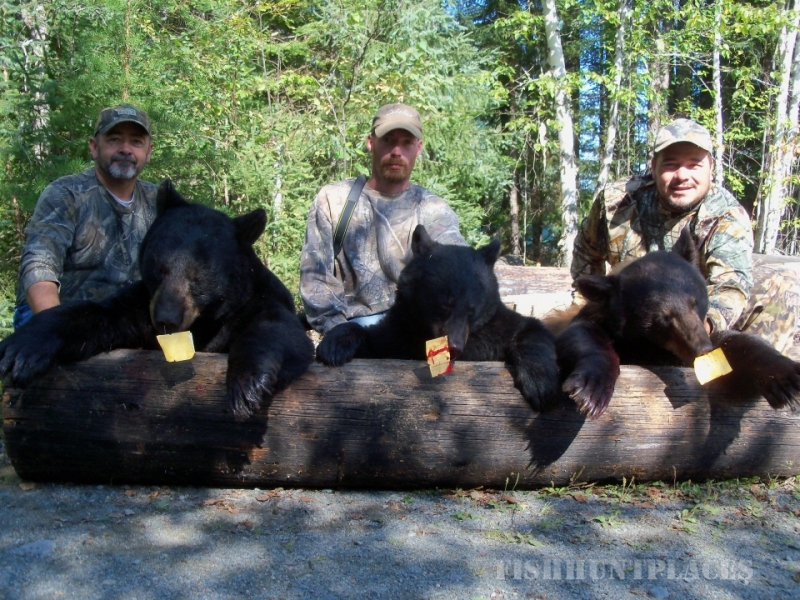 We enjoy sharing our hunting opportunities with responsible hunters who will skillfully harvest their trophy quickly and humanly. For those who hunt with a camera instead of a firearm, come and enjoy viewing our incredible wildlife in their natural surroundings. We will set you up for a successful shoot of your own!